SP: The Crouch End Tube sign - which I have in my bedroom. EW: We like the idea that there was an imaginary Crouch End Tube station. SP: Crouch End does not have a Tube station. In fact, this is only partly true. Before WW2, the north-eastern section of the Northern Line only went as far at the present day "Archway" station, although it was known as "Highgate" at the time. London Transport planned to extend this part of the network by taking over existing LNER surface rail tracks that ran from "Finsbury Park" to "Alexandra Palace," through a station also named "Highgate" (but some distance north of the Underground one), after which the line also branched off to run through "East Finchley" and "Finchley (Church End)" (now "Finchley Central"), before splitting again, with one branch going to "Edgware" via "Mill Hill East" and "Mill Hill (The Hale)" (an interchange with the current "Mill Hill Broadway" National Rail station), and the other to "High Barnet." As part of this scheme, the Tube line was extended from "Highgate"/"Archway", with the tunnels emerging either side of the surface track just south of "East Finchley." New underground platforms were also constructed directly below the surface "Highgate," which would allow passengers to interchange with the "Finsbury Park"/"Alexandra Palace" branch, although it was also envisaged that some trains northbound from "Finsbury Park" would run through "East Finchley" to either "High Barnet" or "Edgware" (the original LNER station was some distance from the Northern Line one, but the track was to be re-routed into the latter), and vice versa. The line would also be extended beyond "Edgware," with several new stations, plus a depot at "Bushey Heath." With the start of WW2, however, only part of this project that was completed, thus creating the line as it exists today. 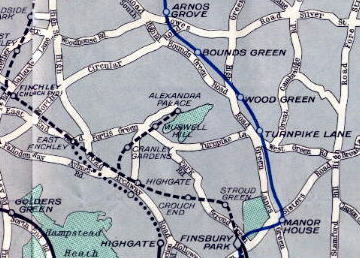 The short branch to "Mill Hill East" was only completed as it was militarily useful, while the electrification of the "Finsbury Park"/"Alexandra Palace" branch was never completed, although it was served by steam services within the London Transport fare structure for some years after the end of the War. As can be seen from the detail of the 1939 London Transport map at the foot of this page, between "Finsbury Park" and "Highgate" there were two additional stations: "Stroud Green" and... "Crouch End." 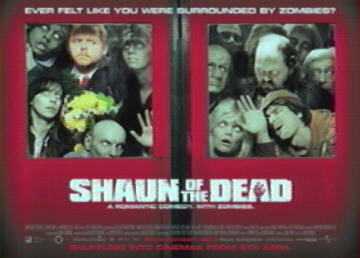 Clearly in the Shaun of the Dead universe, a little bit more (if not all!) of the pre-War scheme was completed!